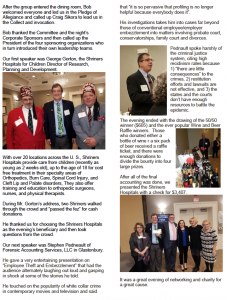 On January 17, 2017, Steve spoke at the 2017 Winter Extravaganza, an charity event sponsored by the New England Claim Executives Association (NECEA), the Hartford Association of Insurance Professionals, the CT Insurance Marketing Association, and the Hartford Pond of the Honorable Order of the Blue Goose International. Steve addressed the topic of employee theft and embezzlement and how pervasive it is within businesses today. He also discussed the need for more employee theft insurance coverage for most businesses. Is “Trust” a consideration in designing and implementing internal controls? Documents and Images – “Live or Memorex”? Embezzlement versus Larceny: Ice Cream Truck?